Before you crazy SMSC addicts start freaking out here's November edition. The topic is Lake and nomination ends in November 23th. The size limit is still 800x600px but now you must choose one CC license from bottom of this post. This sounds a little unfair, since very few paks have enabled climate support for now (needed for beaches and the like). I thought we had lakes since first Simutrans. The topic is lake, if it's in the same level from terrain or one level low it's still a lake. I don't think much lakes have beaches. Every lake in a non-climate aware pakset will have a steep beach ... but then there are pak128, pak64, and pak128.britain with full climate support. I think you can make a nice looking lake with any pakset. Whether the water is "lake" or "ocean" doesn't matter, nor does having it at grade or one level below. What matters most is the choice of items for the shoreline, whether to present a section or lakeshore or an entire lake. Lots of choices. toolbar[X][Y+9]=general_tool,ICON,,7Just remember to change X with the toolbar number, the Y+'s to the tool number and ICON to some number of another existent icon. And you must be using a nightly. Welcome to the lake park. A green space where you can walk, relax and enjoy. The monuments among the trees and the old mill makes this park very beautiful. Visitors can enjoy a wonderful wiew from the wheel or the tower. An old double-deck bus moves people from the city centre to the park, although people can arrive by metro railway too. - AEC Aclo Regent III (double-deck bus). - Pegaso 5020 (blue bus). - Pegaso 6035-A (red articulated bus). - DWK F-1000 L (grey mail van, near the post office). - TMB Series 1000 (subway train). You can get these and many other Spanish addons at The Simutrans Boxroom. 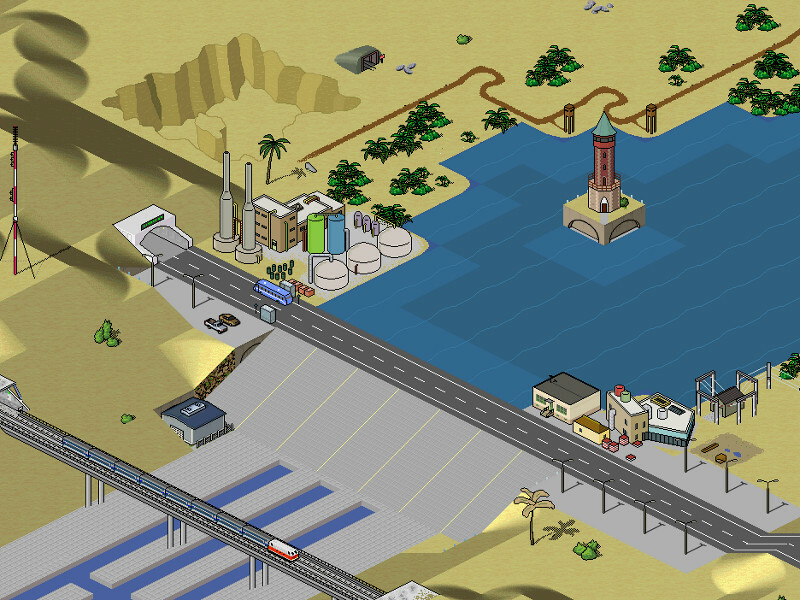 A hydro-electric dam is built across a desert river forming a reservoir, complete with ornate inspection tower. All this is at the unfortunate cost of draining the old lake, now only suitable for mining out precious metals using the small mine next-door. Pak96.comic, engine version r6901, not a real game. The lïttle town of Glace-upon-Lakington is situated near the marvellous little lake in this wonderful mountain area. The castle near the Village is called Fort-upon-Lakington and inhabits the old royal family of Lakington, which counts 7 members still reigning over the province. The new dirt road with it's fabolous new tunel is heading to Seaverbridges which is, by the way, the local leader in scissors-manufacturing. The old Goardshire-Lakington line is taking passengers with it's rusty steam locomotive into the gorgeous valley of Goardshire. Many people come here to reside in the 5 star hotel called "Hotel-upon-Lakington". I personally know the barkeeper and profit of his benevolence, but that's another story to tell. Unfortunately, the town has been stamped out of the ground totally arbitararily and the lake is just a huge blue balloon inflated with air. This isn't a real game either but just a way to show you the gracefulness of pak64.german, which is in fact the pakset used. I hope you liked my little presentation of Glace-upon-Lakington and you will visite the Lakeside-walkway which is situated right at the train station and the busstop, there is a nice café there called "Café-upon-Lakington" . This work is under the CC-BY-SA 3.0 licence. Please see starting Post for more details. is a small lake enclosed in a railway junction in Berlin. Located in the centre of a large metropolis, Lake Park is a place of relaxation and tranquility. And lots of pigeons. This work is released under the CC-BY-SA 3.0 licence.